For the second year running, Eric Lamaze and John Fleischhacker, joint-owners of the 14 year old bay stallion Hickstead, have been awarded the prestigious title of “Owner of the Year” by the Jumping Owners Club. Hickstead and Canadian rider Eric Lamaze continued their superb form to maintain their position as the most successful horse and rider combination in 2009. 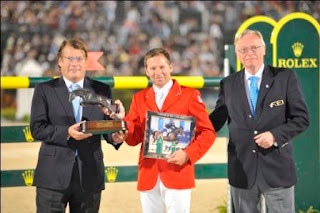 Christian Baillet, Chairman of the Jumping Owners Club, and FEI First Vice President Sven Holmberg presented the award to Eric Lamaze. The ceremony took place during the 2010 Alltech FEI World Equestrian Games™ in Lexington (KY), USA. Formed in 2005 and supported by Rolex, the Jumping Owners Club is an exclusive organisation of international owners which works towards growing the popularity of the sport around the world. It is the only body which represents the views and opinions of the owners, and works closely alongside the FEI in building the profile and inclusiveness of Jumping. Eric Lamaze said, “It’s an honour to win this award for a second time, this has been a great year. I’d like to thank everyone behind us as without their hard work, much of our success would not have been possible”. The FEI Owner of the Year Award was created in 2004 to recognise the most successful owner of each year in the discipline of Jumping. To determine the winner, a classification is established for all horse and rider combinations based on points obtained for the Rolex Rankings during the calendar year. The owner of the horse of the winning combination receives the award; a bronze sculpture produced by Caroline Wallace and a silver picture frame presented by Rolex. Bruno Meier, Chief Executive Officer of Rolex, was on hand to present the picture frame to Eric Lamaze. Christian Baillet, Chairman of the Jumping Owners Club, said, “Hickstead and Eric Lamaze are an outstanding partnership and deserve recognition for their many successes." Previous winners of this award were John, Pat and Lisa Hales (GBR) for Arko III in 2004 and 2005, Serena Hamberg (AUT) for The Sixth Sense in 2006, Nancy Clark (USA) for Shutterfly in 2007, and Eric Lamaze (CAN) & John Fleischhacker (USA) for Hickstead in 2008.